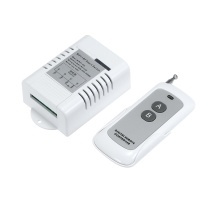 *WiFi + RF Smart Switch, very convenient to use, simple wiring diagram connection way. One/several transmitters can control one/several receivers simultaneously. *Supports APP remotely turn on or off connected appliances. Supports status tracking: device status timely provided to the APP EWeLink(for Android, iOS). *Voice Control: Compatible with Amazon Alexa, Google Home, IFTTT for voice control. Supports scheduled/countdown/loop timers for each device. *Momentary, toggle, latching three working modes can be optionally selected, support remote controllers up to 20 pieces. *Widely used in our daily life. It can connect to the access control system, garage door, light, electric curtain, household appliances, electrically operated doors, motor control, water pump, lifting appliance, security system, oxygenation equipment, exhaust equipment, garden irrigation, outdoor advertising, etc. with AC85V-260V.